"Green Channel - Educating Bangladeshi Youth to be Eco friendly”, an event to make Bangladesh's youth more conscious was organised by United World College (UWC) alumni and United Nations Youth and Students Association of Bangladesh (UNYSAB), with cooperation from big names like Bangladesh Youth Environmental Initiatives (BYEI), International Youth Council (IYC), One Degree Initiative (1dI) and ActionAid's Activista. Its main co-ordinator, Navin Rahman, was helped by a large group of people both young and old. A website called Global Giving encourages people to pitch ideas and gives them an opportunity to make their visions a reality. They have something called 'Open Challenges' which Navin participated in and got selected. She was given challenge to raise 4000 USD however she could. Most of the money came from personal contributions, donations from schools including the UWC Bangladesh Committee, Scholastica and enterprises like Meridian and Mittal. A lot of the initial plan fell apart due to unexpected closures for Hartaals, but they still managed to get things done despite it. There were three stages in the event. Stage one was called EnviLearning. In this stage, the organisers held a two-day workshop. Although a large number signed up, to ensure that each volunteer could be given personal attention, only 60 were chosen for each day. Both days consisted of the same agenda. It began with speeches from inspirational speakers from the likes of Musa Ibrahim and the President of UNYSAB. There were presentations on renewable energy and volunteerism. The idea was to make sure the participants understood the value of what they were doing and to get them more interested in the upcoming events. Later on in the day, the volunteers were taught how to make recycled paper from newspapers and discarded scraps. Then, they were taught how to make compost from old fruits and vegetables. This was to teach the volunteers that recycling does not have to be some big act, it's a simple thing that can be done on a daily basis. 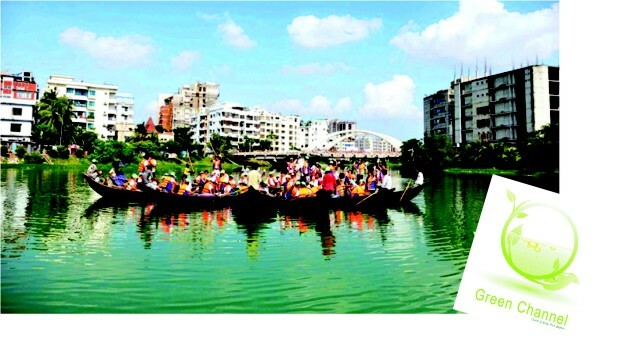 Although getting rid of littering in Dhaka will not be a one-day affair. As the organizers told me, they didn't expect to make a direct sustainable change with one small activity, but they hoped by raising awareness in some it might have a multiplying effect spreading across the country. If each volunteer tells one of their friends, and they in turn tell someone else a large network can be built. The Final Stage: EnviOutcome. This stage urged volunteers to apply what they learnt and experienced into something bigger. Bangladesh has several interested volunteers who want to do something big but often don't know how, or don't have sufficient resources. This final stage, much like Global Giving, asked the volunteers to share their ideas. The best ones would be provided with aid from the cooperating organisations to help bring their ideas to life. Although organizers have worked separately on many different causes and events, together this is their first project of this kind and scale. In the future, they want to expand on the idea of Green Channel, perhaps not using the exact same projects but do something that will have a greater direct sustainable impact. They've told all the EnviVolunteers to keep their eyes and ears open for more of this kind. The exams are over and the coachings have barely restarted. Results are still quite a few weeks away and the parents are currently off your back. What better time than this to hone up your gaming skills and meet other gamers in a battle of supremacy? 7Teen, a group of enterprising gaming tournament organisers are launching a three-day Underground Game Fest from 21st to 23rd July. The tournament will run on consoles and while usually tournaments run under the flagship of Fifa and stick to just one type of console, the organisers have tried to incorporate a variety of games and gaming rigs. Other than Fifa '11, they are hosting a Mortal Kombat championship and a Top Spin 4 [a tennis game popular on Xbox 360] tournament. The tournaments will be held on both PS3 and Xbox 360 and will incorporate the two different consoles in a single tournament. Other than that, an Xbox Kinect will be available, for people trying to enjoy the lighter, less competitive side of gaming, with Dance Central, Kinect Sports, etc. For Fifa '11, 60-90 players will be selected, for the qualifiers, based on a first come - first serve basis. The top 15 players for each console [PS3 and Xbox] will qualify to the league, and have 14 matches to prove their worth. The top two of the respective leagues will qualify for the semifinals and battle it out for the championship on 2 legs, on their opposition's console. For Mortal Kombat, the same method of selection applies, with the only difference being that the games will be played in a 2v2 format, with each player commanding a tag team of two characters. For more information about the tournament and entry fees, check out their Facebook event page by searching “Underground Game Fest (FIFA League, Mortal Kombat, Kinect)”. You can also contact the organisers at: 01671093070 or 01748488551.